Praise God for Time magazine's public recognition of compassion over politics. My prayer is that it inspires a new public movement within the United States, the wealthiest country in the history of the world, to reach out to the world's poor, hungry, homeless, uneducated and ill, both at home and abroad. My pledge, and 2006 resolution, is to actively do my part. Time magazine has named Bill and Melinda Gates and rock star Bono its "Persons of the Year," citing their charitable work and activism aimed at reducing global poverty and improving world health. The magazine said 2005 was a year of extraordinary charity in which people donated record amounts in response to extreme natural disasters, from the tsunami in South Asia to Hurricane Katrina. "Natural disasters are terrible things, but there is a different kind of ongoing calamity in poverty and nobody is doing a better job in addressing it in different ways than Bill and Melinda Gates and Bono," said Jim Kelly, Time's managing editor. The 2005 "Person of the Year" package hits newsstands Monday. "For being shrewd about doing good, for rewiring politics and re-engineering justice, for making mercy smarter and hope strategic and then daring the rest of us to follow, Bill and Melinda Gates and Bono are Time's Persons of the Year," the magazine said. Time praised the Gateses for building the world's largest charity — The Bill and Melinda Gates Foundation, which has a $29 billion endowment — and for "giving more money away faster than anyone ever has" in 2005. The foundation has saved at least 700,000 lives in poor countries by investing in vaccination programs, has donated computers and Internet access to 11,000 libraries and has sponsored the biggest scholarship fund in history, the magazine said. Time said Bono's campaign to make rich countries address the debt of poorer ones has had an equally impressive impact on the world. In 2005, "Bono charmed and bullied and morally blackmailed the leaders of the world's richest countries into forgiving $40 billion in debt owed by the poorest," the magazine said. Bono has earned a remarkable number of political allies around the world and in Washington, where he has courted politicians from both major parties, Time said. "Bono's great gift is to take what has made him famous — charm, clarity of voice, an ability to touch people in their secret heart — combine those traits with a keen grasp of the political game and obsessive attention to detail, and channel it all toward getting everyone, from world leaders to music lovers, to engage with something overwhelming in its complexity," it said. Even archconservative former Sen. Jesse Helms had praise for the Irish singer. "I knew as soon as I met Bono that he was genuine," Helms, who has allied with Bono on AIDS awareness, told Time. 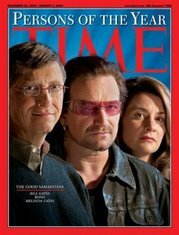 Bono, who first met the Gateses in 2002 to discuss their mutual interests, told Time that the Gates foundation is the second enterprise for Microsoft founder Bill Gates that has changed the world. "And the second act for Bill Gates may be the one that history regards more," the rock star said. In a separate article in the same edition, Time named former presidents Bill Clinton and George H.W. Bush as "Partners of the Year" for their work on behalf of the victims of the tsunami and Hurricane Katrina.